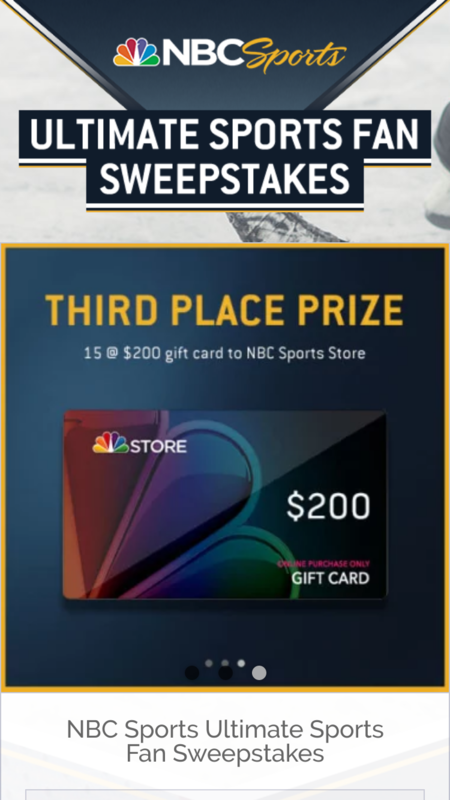 NBC Sports – Ultimate Sports Fan – Win Winner (“Grand Prize”). NO PURCHASE NECESSARY. Void where prohibited. Legal residents of the 50 US or DC who are 18 or older. Begins October 15, 2018 at 10:00 AM ET and ends November 30, 2018 at 3:00 PM ET. Limit 21 entries per person. To enter, and for Official Rules, odds, and prize details, visit nbcsportssweeps.com. Sponsors: NBC Sports, NBC Sports Network L.P, and NBCUniversal Media, LLC. 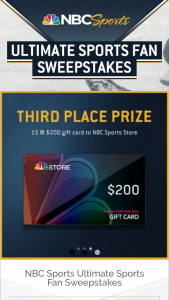 Nbc Sports - Ultimate Sports Fan Sweepstakes Win Free Stuff Win Winner (“Grand Prize”).